4066, Multicolor card Color, Multicolor Offset Cards, Hindu Cards. 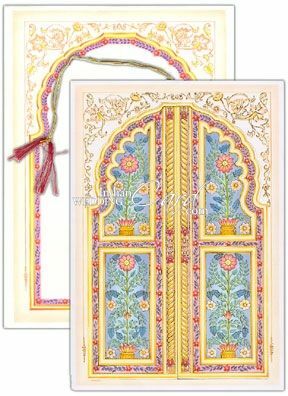 The door open front has been die cut in the shape of a traditional Rajasthani door with miniature painting images and golden border designs having gold leaf work. The front of the card shows a painting of the bride and the groom with similar gold leaf work effect. There is a golden tassel tied to the card for the pull out. The envelope has border design as the jacket.